Los Angeles Lakers fans haven't had much to be happy about this season, as the first year of the LeBron James era will result in a lottery selection rather than a run at the NBA championship. Still, Jordan Brand is reportedly going ahead with plans to release a Lakers-themed Air Jordan 13 this Summer. Early images of the kicks have not yet surfaced, but a mockup based off the color code gives us an idea of what to expect. Jordan Brand has released several team-specific Air Jordans over the years, including those of MJ's rivals, but the purple and gold has never before been applied to the Air Jordan 13. Judging from the mockup, the kicks will come equipped with a predominately white upper with purple accents and gold detailing throughout. 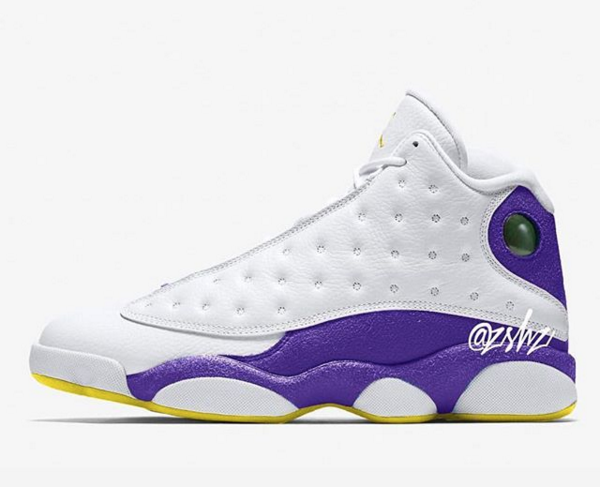 According to sneaker source @Zsneakerheadz, the "Lakers" Air Jordan 13 is tentatively slated to drop on July 20.